This article is about the county in England. For other uses, see Kent (disambiguation). Kent is a county in South East England and one of the home counties. It borders Greater London to the north-west, Surrey to the west and East Sussex to the south-west. The county also shares borders with Essex along the estuary of the River Thames (connected by land via High Speed 1 and the Dartford Crossing), and with the French department of Pas-de-Calais through the Channel Tunnel. The county town is Maidstone. Canterbury Cathedral in Kent has been the seat of the Archbishop of Canterbury, leader of the Church of England, since the Reformation. Prior to that it was built by Catholics, dating back to the conversion of England to Catholicism by Saint Augustine that began in the 6th century. Before the English Reformation the cathedral was part of a Benedictine monastic community known as Christ Church, Canterbury, as well as being the seat of the Catholic Archbishop of Canterbury. The last Catholic Archbishop of Canterbury was Reginald Pole. Rochester Cathedral is also in Kent, in Medway. 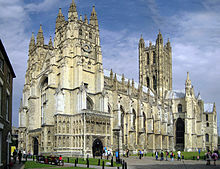 It is the second-oldest cathedral in England, with Canterbury Cathedral being the oldest. Between London and the Strait of Dover, which separates it from mainland Europe, Kent has seen both diplomacy and conflict, ranging from the Leeds Castle peace talks of 1978 and 2004 to the Battle of Britain in World War II. Because of its relative abundance of fruit-growing and hop gardens, Kent is known as "The Garden of England". Kent's economy is greatly diversified; haulage, logistics, and tourism are major industries. In northwest Kent industries include extraction of aggregate building materials, printing and scientific research. Coal mining has also played its part in Kent's industrial heritage. Large parts of Kent are within the London commuter belt and its strong transport connections to the capital and the nearby continent makes Kent a high-income county. Twenty-eight per cent of the county forms part of two Areas of Outstanding Natural Beauty: the North Downs and The High Weald. The name Kent is believed to be of British Celtic origin and was known in Old English as Cent, Cent lond, Centrice (all pronounced with a hard “C” as “Kent-”). In Latin sources Kent is mentioned as Cantia, Canticum. The meaning is explained by some researchers as "coastal district," or "corner-land, land on the edge" (compare Welsh cant "bordering of a circle, tire, edge," Breton cant "circle"). If so, the name could be etymologically related to the placename Cantabria, historically a Celtiberian-speaking coastal region in pre-Roman Iberia, today a province of Spain. The area has been occupied since the Palaeolithic era, as attested by finds from the quarries at Swanscombe. The Medway megaliths were built during the Neolithic era. There is a rich sequence of Bronze Age, Iron Age, and Roman era occupation, as indicated by finds and features such as the Ringlemere gold cup and the Roman villas of the Darent valley. 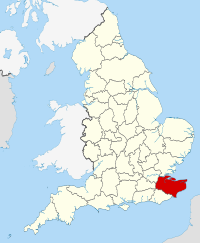 The modern name of Kent is derived from the Brythonic word kantos meaning "rim" or "border", or possibly from a homonymous word kanto "horn, hook" (< PIE *kn̥g-tó, cfr. cornwall < cornus "horn"). This describes the eastern part of the current county area as a border land or coastal district. Julius Caesar had described the area as um, or home of the Cantiaci in 51 BC. The extreme west of the modern county was by the time of Roman Britain occupied by Iron Age tribes, known as the Regnenses. Caesar wrote that the people of Kent are 'by far the most civilised inhabitants of Britain'. East Kent became a kingdom of the Jutes during the 5th century and was known as Cantia from about 730 and recorded as Cent in 835. The early medieval inhabitants of the county were known as the Cantwara, or Kent people. These people regarded the city of Canterbury as their capital. In 597, Pope Gregory I appointed the religious missionary (who became Saint Augustine of Canterbury after his death) as the first Archbishop of Canterbury. In the previous year, Augustine successfully converted the pagan King Æthelberht of Kent to Christianity. The Diocese of Canterbury became England's first Episcopal See with first cathedral and has since remained England's centre of Christianity. The second designated English cathedral was in Kent at Rochester Cathedral. In the 11th century, the people of Kent adopted the motto Invicta, meaning "undefeated" or "unconquered". This naming followed the invasion of Britain by William of Normandy. The Kent people's continued resistance against the Normans led to Kent's designation as a semi-autonomous county palatine in 1067. Under the nominal rule of William's half-brother Odo of Bayeux, the county was granted similar powers to those granted in the areas bordering Wales and Scotland. Kent was traditionally partitioned into East and West Kent, and into lathes and hundreds. The traditional border of East and West Kent was the county's main river, the Medway. Men and women from east of the Medway are Men (or Maids) of Kent, those from the west are Kentishmen or Kentish Maids. During the medieval and early modern period, Kent played a major role in several of England's most notable rebellions, including the Peasants' Revolt of 1381, led by Wat Tyler,Jack Cade's Kent rebellion of 1450, and Wyatt's Rebellion of 1554 against Queen Mary I. The 18th century was dominated by wars with France, during which the Medway became the primary base for a fleet that could act along the Dutch and French coasts. When the theatre of operation moved to the Atlantic, this role was assumed by Portsmouth and Plymouth, with Chatham concentrating on shipbuilding and ship repair. As an indication of the area's military importance, the first Ordnance Survey map ever drawn was a one-inch map of Kent, published in 1801. Many of the Georgian naval buildings still stand. In the early 19th century, smugglers were very active on the Kent coastline. Gangs such as The Aldington Gang brought spirits, tobacco and salt to the county, and transported goods such as wool across the sea to France. In 1889 the County of London was created and took over responsibility for local administration of parts of north-west Kent. These included the towns of Deptford, Greenwich, Woolwich, Lee, Eltham, Charlton, Kidbrooke and Lewisham. In 1900, however, Kent absorbed the district of Penge. Some of Kent is contiguous with the Greater London sprawl, notably parts of Dartford. During the Second World War much of the Battle of Britain was fought in the skies over Kent. Between June 1944 and March 1945 more than 10,000 V1 flying bombs, or "Doodlebugs", were fired towards London from bases in Northern France. Although many were destroyed by aircraft, anti-aircraft guns and barrage balloons, both London and Kent were hit by around 2,500 of these bombs. After the war Kent's borders changed several more times. In 1965 the London boroughs of Bromley and Bexley were created from nine towns formerly in Kent. In 1998 Rochester, Chatham, Gillingham and Rainham left the administrative county of Kent to form the Unitary Authority of Medway. Plans for another unitary authority in north-west Kent were dropped, but in 2016 consultations began between five Kent local authorities (Canterbury, Thanet, Dover, Folkestone & Hythe, and Ashford) with a view to forming a new unitary authority for East Kent, outside the auspices of Kent County Council. For almost nine centuries a small part of present-day East London (the North Woolwich, London E16 area), formed part of Kent. The most likely reason for this is that in 1086 Hamon, dapifer and Sheriff of Kent, owned the manor and, perhaps illegally, annexed it to Kent. It ceased to be considered part of the county in 1965[disputed (for: contradicting related articles) – discuss] upon creation of the London Borough of Newham. Kent is one of the warmest parts of Britain. On 10 August 2003, in the hamlet of Brogdale near Faversham the temperature reached 38.5 °C (101.3 °F), the hottest temperature ever officially recorded in the United Kingdom. Kent is in the southeastern corner of England. It borders the River Thames and the North Sea to the north, and the Straits of Dover and the English Channel to the south. France is 34 kilometres (21 mi) across the Strait. The major geographical features of the county are determined by a series of ridges and valleys running east-west across the county. These are the results of erosion of the Wealden dome, a dome across Kent and Sussex created by alpine movements 10–20 million years ago. This dome consists of an upper layer of chalk above successive layers of Upper Greensand, Gault Clay, Lower Greensand, Weald Clay, and Wealden sandstone. The ridges and valleys formed when the exposed clay eroded faster than the exposed chalk, greensand, or sandstone. Sevenoaks, Maidstone, Ashford, and Folkestone are built on greensand, while Tonbridge and Tunbridge Wells are built on sandstone. Dartford, Gravesend, the Medway towns, Sittingbourne, Faversham, Canterbury, Deal, and Dover are built on chalk. The easterly section of the Wealden dome has been eroded away by the sea, and cliffs such as the White Cliffs of Dover are present where a chalk ridge known as the North Downs meets the coast. Spanning Dover and Westerham is the Kent Downs Area of Outstanding Natural Beauty. The Wealden dome is a Mesozoic structure lying on a Palaeozoic foundation, which can often create the right conditions for coal formation. This is found in East Kent roughly between Deal, Canterbury, and Dover. The Coal Measures within the Westphalian Sandstone are deep about 250–400 m (820–1,310 ft) and subject to flooding. They occur in two major troughs, which extend under the English Channel. Seismic activity has occasionally been recorded in Kent, though the epicentres were offshore. In 1382 and 1580 there were two earthquakes exceeding 6.0 on the Richter Scale. In 1776, 1950, and on 28 April 2007 there were earthquakes of around 4.3. The 2007 earthquake caused physical damage in Folkestone. A further quake on 22 May 2015 measured 4.2 on the Richter Scale. The epicentre was in the Sandwich area of east Kent at a depth of some ten miles from the surface. There was little if any damage reported. Kent's principal river, the River Medway, rises near East Grinstead in Sussex and flows eastwards to Maidstone. Here it turns north and breaks through the North Downs at Rochester, then joins the estuary of the River Thames as its final tributary near Sheerness. The Medway is some 112 kilometres (70 mi) long. The river is tidal as far as Allington lock, but in earlier times, cargo-carrying vessels reached as far upstream as Tonbridge. The Medway has captured the head waters of other rivers such as the River Darent. Other rivers of Kent include the River Stour in the east. A 2014 study found that Kent shares significant reserves of shale oil with other neighbouring counties, totalling 4.4 billion barrels of oil, which then Business and Energy Minister Michael Fallon said "will bring jobs and business opportunities" and significantly help with UK energy self-sufficiency. Fracking in the area is required to achieve these objectives, which has been opposed by environmental groups. At the 2011 census, Kent, including Medway, had 1,727,665 residents (18.0% of which in Medway); had 711,847 households (17.5% of which in Medway) and had 743,436 dwellings (14.8% of which in Medway). 51.1% of Kent's population excluding Medway was female — as to Medway this proportion was 50.4%. The tables below provide statistics for the administrative county of Kent, that is, excluding Medway. Kent County Council (KCC) and its 12 district councils administer most of the county (3352 km²), while the Medway Towns Council, a unitary authority and commonly called Medway Council, administers the more densely populated remainder (192 km²). Together they have around 300 town and parish councils. Kent County Council's headquarters are in Maidstone, while Medway's offices are at Gun Wharf, Chatham. At the 2013 county council elections, control of Kent County Council was held by the Conservatives, which won 44 of the council's 83 seats. 17 seats were won by the United Kingdom Independence Party, 13 by the Labour Party, 7 were won by the Liberal Democrats, 1 by the Green Party and 1 by the Swanscombe and Greenhithe Residents Association. At the 2007 local elections, control of Medway Council was held by the Conservatives; 33 of the council's 55 seats were held by the Conservatives, 13 by the Labour Party, 8 by the Liberal Democrats and 1 by an Independent. All but one of Kent's district councils are controlled by the Conservatives, a minority Labour administration taking control of Thanet District in December 2011 following the defection of a Conservative councillor to the Independent group. In the council elections of May 2015 the United Kingdom Independence Party (UKIP) took control of the Council, the first and so far only one in the UK. In October 2015 UKIP lost overall control following a series of resignations, although remaining the largest party, only for UKIP to regain control once more following ward elections in August 2016. At the national level, Kent is represented in Parliament by 17 MPs, all of whom were Conservative until the general election of June 2017. During this election the constituency of Canterbury elected Rosie Duffield, the first ever Labour MP to hold the seat since the constituency was formed in 1918. Kent is in the European Parliament constituency of South East England, which elects ten members of the European Parliament. At the 2001 UK census, employment statistics for the residents in Kent, including Medway, were as follows: 41.1% in full-time employment, 12.4% in part-time employment, 9.1% self-employed, 2.9% unemployed, 2.3% students with jobs, 3.7% students without jobs, 12.3% retired, 7.3% looking after home or family, 4.3% permanently sick or disabled, and 2.7% economically inactive for other reasons. Of residents aged 16–74, 16% had a higher education qualification or the equivalent, compared to 20% nationwide. The average hours worked per week by residents of Kent were 43.1 for males and 30.9 for females. Their industry of employment was 17.3% retail, 12.4% manufacturing, 11.8% real estate, 10.3% health and social work, 8.9% construction, 8.2% transport and communications, 7.9% education, 6.0% public administration and defence, 5.6% finance, 4.8% other community and personal service activities, 4.1% hotels and restaurants, 1.6% agriculture, 0.8% energy and water supply, 0.2% mining, and 0.1% private households. This is higher than the whole of England for construction and transport/communications, and lower for manufacturing. Kent is sometimes known as the "Garden of England" for its abundance of orchards and hop gardens. Distinctive hop-drying buildings called oasts are common in the countryside, although many have been converted into dwellings. Nearer to London, market gardens also flourish. Kent is the main area for hazelnut production in the UK. However, in recent years, there has been a significant drop in agriculture, and industry and services are increasing their utilisation of the area. This is illustrated by the following table of economic indicator gross value added (GVA) between 1995 and 2000 (figures are in millions of British Pounds Sterling). North Kent is heavily industrialised with cement-making at Northfleet and Cuxton, brickmaking at Sittingbourne, shipbuilding on the Medway and Swale, engineering and aircraft design and construction at Rochester, chemicals at Dartford and papermaking at Swanley, and oil refining at Grain. A steel mini mill in Sheerness and a rolling mill in Queenborough.There are two nuclear power stations at Dungeness, although the older one, built in 1965, was closed at the end of 2006. Cement-making, papermaking, and coal-mining were important industries in Kent during the 19th and 20th century. Cement came to the fore in the 19th century when massive building projects were undertaken. The ready supply of chalk and huge pits between Stone and Gravesend bear testament to that industry. There were also other workings around Burham on the tidal Medway. Chalk, gravel and clay were excavated on Dartford Heath for centuries. Kent's original paper mills stood on streams like the River Darent, tributaries of the River Medway, and on the River Stour. Two 18th century mills were on the River Len and at Tovil on the River Loose. In the late 19th century huge modern mills were built at Dartford and Northfleet on the River Thames and at Kemsley on The Swale. In pre-industrial times, almost every village and town had its own windmill or watermill, with over 400 windmills known to have stood at some time. Twenty eight survive within the county today, plus two replica mills and a further two in that part of Kent now absorbed into London. All the major rivers in the county were used to power watermills. From about 1900, several coal pits operated in East Kent. The Kent Coalfield was mined during the 20th century at several collieries, including Chislet, Tilmanstone, Betteshanger, and the Snowdown Colliery, which ran from 1908 to 1986. The west of the county (including Tunbridge Wells, Tonbridge and Sevenoaks) has less than 50% of the average claimant count for low incomes or worklessness as the coastal districts of Dover, Folkestone and Hythe, and Thanet (chiefly three resorts: Ramsgate, Broadstairs and Margate). West and Central Kent has long had many City of London commuters. Kent's geographical location between the Straits of Dover and London has influenced its architecture, as has its Cretaceous geology and its good farming land and fine building clays. Kent's countryside pattern was determined by a gavelkind inheritance system that generated a proliferation of small settlements. There was no open-field system, and the large tracts were owned by the two great abbeys, Christ Church, Canterbury and St Augustine's Abbey, that did not pass into the hands of the king during the Reformation. Canterbury Cathedral is the United Kingdom's metropolitan cathedral; it was founded in AD 598 and displays architecture from all periods. There are nine Anglo-Saxon churches in Kent. Rochester Cathedral is England's second-oldest cathedral, the present building built in the Early English Style. These two dioceses ensured that every village had a parish church. The sites of Richborough Castle and Dover Castle, along with two strategic sites along Watling Street, were fortified by the Romans and Normans. Other important sites include Canterbury city walls and Rochester Castle. [clarification needed] There remained a need to defend London and thus Kent. Deal Castle, Walmer Castle, Sandown Castle (whose remains were eroded by the sea in the 1990s) were constructed in late mediaeval times, and HM Dockyard, at Chatham and its surrounding castles and forts—Upnor Castle, Great Lines, and Fort Amherst—more recently. 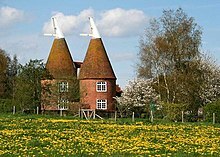 Kent has three unique vernacular architecture forms: the oast house, the Wealden hall house, and Kentish peg-tiles. Kent has bridge trusts to maintain its bridges, and though the great bridge (1387) at Rochester was replaced there are medieval structures at Aylesford, Yalding and Teston. With the motorways in the late twentieth century came the M2 motorway bridge spanning the Medway and the Dartford tunnel and the Dartford Bridge spanning the Thames. The Bluewater shopping centre at Greenhithe is the United Kingdom's largest shopping mall. Kent has provided inspiration for several notable writers and artists. Canterbury's religious role gave rise to Chaucer's Canterbury Tales, a key development in the English language. The father of novelist Charles Dickens worked at the Chatham Dockyard; in many of his books, the celebrated novelist featured the scenery of Chatham, Rochester, and the Cliffe marshes. During the late 1930s, Nobel Prize-awarded novelist William Golding worked as a teacher at Maidstone Grammar School, where he met his future wife Ann Brookfield. William Caxton, who first introduced the printing press to England, was born in Kent; the recent invention was key in helping many Kent dialect words and spellings to become standard in English. A number of significant artists came from Kent, including Thomas Sidney Cooper, a painter of landscapes, often incorporating farm animals, Richard Dadd, a maker of faery paintings, and Mary Tourtel, the creator of the children's book character, Rupert Bear. The artist Clive Head was also born in Kent. The landscape painter J. M. W. Turner spent part of his childhood in the town of Margate in East Kent, and regularly returned to visit it throughout his life. The East Kent coast inspired many of his works, including some of his most famous seascapes. Kent has also been the home to artists including Frank Auerbach, Tracey Emin and Stass Paraskos. Kent was also the location of the largest number of art schools in the country during the nineteenth century, estimated by the art historian David Haste, to approach two hundred. This is believed to be the result of Kent being a front line county during the Napoleonic Wars. At this time, before the invention of photography, draughtsmen were used to draw maps and topographical representations of the fields of battle, and after the wars ended many of these settled permanently in the county in which they had been based. Once the idea of art schools had been established, even in small towns in Kent, the tradition continued, although most of the schools were very small one man operations, each teaching a small number of daughters of the upper classes how to draw and make watercolour paintings. Nonetheless, some of these small art schools developed into much larger organisations, including Canterbury College of Art, founded by Thomas Sidney Cooper in 1868, which is today the University for the Creative Arts. The county's largest theatre is the Marlowe Theatre in the centre of Canterbury. Other venues for live music include Leas Cliff Hall in Folkestone and the Assembly Hall in Tunbridge Wells. It re-opened, after being completely rebuilt, in October 2011. Music festivals that take place in Kent include Chilled in a Field Festival, Electric Gardens, Hop Farm Festival, In the Woods Festival, and Lounge On The Farm. With the Roman invasion, a road network was constructed to connect London to the Channel ports of Dover, Lympne and Richborough. The London–Dover road was Watling Street. These roads are now approximately the A2, B2068, A257, and the A28. The A2 runs through Dartford (A207), Gravesend, Rochester, Canterbury and Dover; the A20 through Eltham, Wrotham, Maidstone, Charing, Ashford. Hythe, Folkestone and Dover; the A21 around Sevenoaks, Tonbridge, Tunbridge Wells and on to Hastings in East Sussex. In the 1960s, two motorways were built; the M2 from Medway to Faversham, and the M20 from Swanley to Folkestone. Part of the M25 runs through Kent, from Westerham to the Dartford Crossing. The M26 motorway, built in 1980, provides a short link between the M25 at Sevenoaks and the M20 near Wrotham. Kent currently has more motorways by distance than any other county in the UK, with sections of the M2, M20, M25 and M26 totalling 173 km (107 mi) within the extents of the ceremonial county. The medieval Cinque Ports, except for the Port of Dover, have all now silted up. The Medway Estuary has been an important port and naval base for 500 years. The River Medway is tidal up to Allington and navigable up to Tonbridge. Kent's two canals are the Royal Military Canal between Hythe and Rye, which still exists, and the Thames and Medway Canal between Strood and Gravesend. Built in 1824, it was purchased in 1846 by the railways, which partially backfilled it. Container ports are at Ramsgate and Thamesport. Following the closures across the lower Medway, and the Swale to the Isle of Sheppey, during the 20th century, the Woolwich Ferry is the only domestic ferry that runs in the broadest definition of the county. The earliest locomotive-driven passenger-carrying railway in Britain was the Canterbury and Whitstable Railway which opened in 1830. This and the London and Greenwich Railway later merged into South Eastern Railway (SER). By the 1850s, SER's networks had expanded to Ashford, Ramsgate, Canterbury, Tunbridge Wells, and the Medway towns. SER's major London termini were London Bridge, Charing Cross, and Cannon Street. Kent also had a second major railway, the London, Chatham and Dover Railway (LCDR). Originally the East Kent Railway in 1858, it linked the northeast Kent coast with London terminals at Victoria and Blackfriars. The two companies merged in 1899, forming the South Eastern and Chatham Railway (SECR), further amalgamated with other railways by the Railways Act 1921 to form the Southern Railway. Britain's railways were nationalised in 1948, forming British Railways (shortened to British Rail in the mid-1960s). The railways were privatised in 1996 and most Kent passenger services were franchised to Connex South Eastern. Following financial difficulties, Connex lost the franchise and was replaced by South Eastern Trains and after Southeastern. The Channel Tunnel was completed in 1994 and High Speed 1 in November 2007 with a London terminus at St Pancras. A new station, Ebbsfleet International, opened between Dartford and Gravesend, serving northern Kent. The high speed lines will be utilised to provide a faster train service to coastal towns like Ramsgate and Folkestone. This station is in addition to the existing station at Ashford International, which has suffered a massive cut in service as a result. In addition to the "main line" railways, there are several light, heritage, and industrial railways in Kent. There are three heritage, standard gauge railways; Spa Valley Railway near Tunbridge Wells on the old Tunbridge Wells West branch, East Kent Railway on the old East Kent coalfield area and the Kent and East Sussex Railway on the Weald around Tenterden. In addition there is the 15-inch (380 mm) gauge, Romney, Hythe and Dymchurch Railway on the southeast Kent coast along the Dungeness peninsula. Finally, there is the 2 ft 6 in (0.76 m), industrial Sittingbourne & Kemsley Light Railway, previously the Bowaters Paper Railway. A limited number of charter flights are provided by Lydd Airport at Lydd. However, most passengers across the South East use the larger Heathrow, Gatwick, Stansted and Luton airports. In 2002, it was revealed that the government was considering building a new four-runway airport on the marshland near the village of Cliffe on Hoo Peninsula. This plan was dropped in 2003 following protests by cultural and environmental groups. However further plans for a Thames Estuary Airport on the Kent coast have subsequently emerged, including the Thames Hub Airport, again sited on the Isle of Grain and designed by Lord Foster, and the London Britannia Airport plan, colloquially known as "Boris Island" due to its being championed by the former Mayor of London Boris Johnson, which would see a six runway airport built on an artificial island to be towards the Shivering Sands area, north-east of Whitstable. Both of these options were dropped in 2014 in favour of expansion at either Gatwick or Heathrow Airport, the latter finally being the chosen option following Theresa May's installation as Prime Minister in summer 2016. Kent has four universities: Canterbury Christ Church University with campuses throughout East Kent; University of Kent, with campuses in Canterbury and Medway; University of Greenwich (a London University), with sites at Woolwich, Eltham, London and Medway; the University for the Creative Arts (UCA) also has three of its five campuses in the county. Although much of Britain adopted a comprehensive education system in the 1970s, Kent County Council (KCC) and Medway Unitary Authority are among around fifteen local authorities still providing wholly selective education through the eleven-plus examination with students allocated a place at a secondary modern school or at a grammar school. Together, the two Kent authorities have 38 of the 164 grammar schools remaining in Britain. Kent County Council has the largest education department of any local council in Britain, providing school places for over 289,000 pupils. In 2005–06, Kent County Council and Medway introduced a standardised school year, based on six terms, as recommended by the Local Government Association in its 2000 report, "The Rhythms of Schooling". Kent County Council Local Education Authority maintains 96 secondary schools, of which 33 are selective schools and 63 are secondary modern schools. Music education is provided by Kent Music (formerly Kent Music School), which has its origins in the 1940s. Kent Music provides services across the county including Kent County Youth Orchestra, Kent Youth Choirs, and an annual summer school at Benenden School. Kent has the highest number of National Challenge schools in England: schools which are branded 'failing' based on the British Government's floor targets that 30% of pupils achieve at least 5 GCSE grades A* to C. Of the 63 secondary modern schools, 33 missed this target; thus 52% of Kent secondary modern schools (34% out of all 96 maintained secondary schools) are 'failing'. 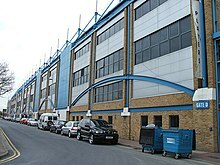 Priestfield Stadium is the home of Gillingham FC, Kent's only Football League team. In association football, Kent's highest ranked football team is Gillingham FC, who play in Football League One. Maidstone United were a Football League side from 1989 until going bankrupt in 1992. Kent clubs in the higher levels of non-league football include the current incarnation of Maidstone United and Dover Athletic playing in the National League along with Ebbsfleet United, who were promoted in 2017. Dartford currently play in National League South, the sixth tier of the English football pyramid. Kent is represented in cricket by Kent County Cricket Club. The club was a founder member of the County Championship in 1890 and has won the competition, the major domestic first-class cricket competition, seven times. The club is based at the St Lawrence Ground in Canterbury and also plays matches at the Nevill Ground in Royal Tunbridge Wells and the County Cricket Ground, Beckenham. The Kent Women cricket team has won the Women's County Championship seven times since it was established in 1997. Cricket has traditionally been a popular sport in the county and Kent is considered one of the locations in which the game first developed. Teams have represented the county since the early 18th century. The Kent Cricket League is the top level of club competition within Kent and features teams from throughout the county, including areas such as Beckenham and Bexley which were formerly part of the county. Canterbury Hockey Club and Holcombe Hockey Club both play in the top division in both the men's and women's England Hockey Leagues. Sevenoaks Hockey Club's women first XI plays in the second tier of national competition. In Rugby Union Canterbury RFC play in the fourth tier of English rugby in the National League 2 South. Gravesend RFC and Tonbridge Juddians both play in the fifth tier National League 3 London & SE. Blackheath FC, a club within the historic boundaries of the county, play in National League 1, the third tier of English rugby. In motorsport, the Brands Hatch circuit near Swanley has played host to a number of national and international racing events, and hosted 12 runnings of the British Grand Prix in various years between 1964 and 1986. Kent is home to two National League netball clubs, both based in northwest Kent: Telstars (Premier Division 2) and KCNC (Premier Division 3). Much of Kent is served by the BBC's South East region, which is based in Tunbridge Wells and provides local news for the county and East Sussex. Its commercial rival is ITV Meridian Ltd, which has a newsroom at The Maidstone Studios despite the main studio being based in Hampshire. Main transmitters providing these services are at West Hougham, near Dover and Blue Bell Hill, between Chatham and Maidstone. A powerful relay transmitter at Tunbridge Wells serves the town and surrounding area. Those parts of Kent closest to London such as Swanley, Westerham, Dartford, Gravesend and Sevenoaks lie within the ITV London and BBC London areas, taking their television signals from the Crystal Palace transmitter. Kent has three county-wide stations – BBC Radio Kent, based in Tunbridge Wells; and the commercial stations Heart Kent and Gold, both based in Whitstable and London. Most of the county is covered by local radio network KMFM, owned by the KM Group. Since March 2012, programmes have been the same across all seven stations in the network: KMFM Ashford, KMFM Canterbury, KMFM Maidstone, KMFM Medway, KMFM Shepway and White Cliffs Country, KMFM Thanet and KMFM West Kent. Dover Community Radio (DCR) offers a podcasting service for the people of Dover district on their website, hoping in the future to apply for a community radio licence to cover the town and its environs. A newly established digital radio platform has been created in Deal. Deal Radio is an online radio station created for the East Kent communities in and around the town of Deal. The KM Group, KOS Media and Kent Regional News and Media all provide local newspapers for most of the large towns and cities. County-wide papers include the Kent Messenger, Kent on Saturday, Kent on Sunday, and the Kent and Sussex Courier. 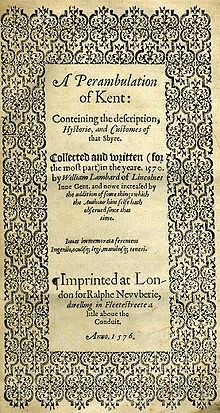 ^ "Kent | Origin and history of Kent by Online Etymology Dictionary". Etymonline.com. 12 November 1949. Archived from the original on 16 September 2017. Retrieved 16 September 2017. ^ a b c Howe, Ian (2012). Kent Dialect. Bradwell Books. p. 26. ^ Ashbee, Paul (2005). Kent in prehistoric times. Tempus. ^ Glover, J. Place names of Kent. ^ Witney, K. P. (1982). The Kingdom of Kent. ^ "Victoria County History of Kent". KentArchaeology.org.uk. May 2006. Archived from the original on 16 February 2007. Retrieved 20 April 2007. ^ "Archbishop of Canterbury". Spartacus.SchoolNet.co.uk. Archived from the original on 18 June 2007. Retrieved 19 June 2007. ^ David Bates (1975). The Character and Career of Odo, Bishop of Bayeux (1049/50-1097). Speculum. ^ "Peasants' Revolt". Britannia.com. Archived from the original on 4 April 2007. Retrieved 20 April 2007. ^ "Wyatt's Rebellion". Brit Politics. Britology Ltd. Archived from the original on 4 March 2016. Retrieved 5 September 2015. ^ The Historic Dockyard Chatham – where legends were created. Jarrold Publishing. 2005. ^ "The Dutch in the Medway". DeRuyter.org. Archived from the original on 17 May 2007. Retrieved 20 April 2007. ^ Oliver, Richard (1995). Ordnance Survey maps: a concise guide for historians 2nd Ed. Ordnance Survey. ISBN 978-1-870598-24-8. ^ "South-East England". Smuggler's Britain. Archived from the original on 16 May 2007. Retrieved 20 April 2007. ^ a b c d Jessup, Frank W. (1966). Kent History Illustrated. Kent County Council. ^ "Medway". Communities and Local Government. Archived from the original on 27 April 2007. Retrieved 20 April 2007. ^ "UK Records". BBC Weather. Archived from the original on 26 January 2009. Retrieved 10 June 2009. ^ Climate averages 1981–2010 Archived 24 March 2014 at the Wayback Machine. Met Office (19 November 2008). Retrieved on 17 July 2013. ^ English Channel. Microsoft Encarta Online Encyclopedia 2007. Archived from the original on 1 November 2009. Retrieved 20 April 2007. ^ a b Greensand Way in Kent. Kent Count Council. 1992. ISBN 978-1-873010-23-5. ^ a b c Britain's Structure and Scenery, L.Dudley Stamp, Pub September 1946, Collins New Naturalist Series. ^ "Kent Downs". KentDowns.org. Archived from the original on 5 April 2007. Retrieved 20 April 2007. ^ "Geology of Kent and Boulonnais". The Geology Shop. 2000. Archived from the original on 5 November 2009. Retrieved 8 August 2009. ^ Hill, Amelia (29 April 2007). "Quake causes Kent Families to flee Homes". The Guardian. UK. Archived from the original on 31 May 2007. Retrieved 28 April 2007. ^ "Kent hit by 4.2 earthquake, shaking houses and waking residents". Guardian News and Media Ltd. 22 May 2015. Archived from the original on 7 June 2015. Retrieved 7 June 2015. ^ a b Bowskill, Derek. Map of the River Medway. ^ Prynn, Jonathan (23 May 2014). "Massive oil reserves lie under commuter belt in South, says report". London Evening Standard. p. 8. ^ a b c d e "Neighbourhood Statistics". Statistics.gov.uk. Archived from the original on 31 July 2013. Retrieved 5 May 2013. ^ Kent (Borough of Gillingham and City of Rochester upon Medway) (Structural Change) Order 1996 "Kent (Borough of Gillingham and City of Rochester upon Medway) (Structural Change) Order 1996". HMSO. Archived from the original on 19 December 2010. Retrieved 17 March 2010. ^ "Council and democracy". Kent County Council. Archived from the original on 6 February 2007. Retrieved 19 April 2007. ^ "Democratically elected representatives in Medway". Medway Council. Archived from the original on 12 May 2007. Retrieved 13 May 2007. ^ "Rosie Duffield wins Canterbury for Labour for first time". BBC News. Archived from the original on 12 June 2017. Retrieved 16 June 2017. ^ "UK MEPs". UK Office of the European Parliament. Archived from the original on 20 March 2007. Retrieved 3 April 2007. ^ "Hazelnut and walnut production" (PDF). Calu. Archived from the original (PDF) on 4 February 2013. Retrieved 15 January 2013. ^ "Regional Gross Value Added" (PDF). Office for National Statistics. Archived from the original (PDF) on 28 July 2011. Retrieved 3 April 2007. ^ "Closure of Dungeness Power Station". BBC News. 31 December 2006. Archived from the original on 15 March 2007. Retrieved 3 April 2007. ^ "The Chatham News Index" (PDF). Parret & Neves. 1996. Archived from the original (PDF) on 14 October 2006. Retrieved 19 April 2007. ^ "Coal fields Heritage Initiative". Dover Museum. Archived from the original on 20 February 2007. Retrieved 20 April 2007. ^ "Snowdown Colliery". FreeUK.com. Archived from the original on 11 March 2008. Retrieved 19 April 2007. ^ Newman, John (1969). "The Buildings of Kent". In Pevsner (ed.). North East and East Kent. Buildings of England (3 ed.). Harmondsworth, England: Penguin Books. p. 35. ISBN 978-0140710397. ^ Newman, John (1969). "The Buildings of Kent". In Pevsner (ed.). North East and East Kent. Buildings of England (3 ed.). Harmondsworth, England: Penguin Books. pp. 36–123. ISBN 978-0140710397. ^ Newman, John (1969). "The Buildings of Kent". In Pevsner (ed.). North East and East Kent. Buildings of England (3 ed.). Harmondsworth, England: Penguin Books. p. 58. ISBN 978-0140710397. ^ "Charles Dickens". InfoBritain. Archived from the original on 17 April 2007. Retrieved 20 April 2007. ^ "William Golding – Biography". William-Golding.co.uk. Archived from the original on 24 February 2003. Retrieved 20 June 2007. ^ "The Turner Connection". TurnerContemporary.org. Archived from the original on 23 July 2007. Retrieved 20 June 2007. ^ Kennedy, Maev (28 September 2011). "Marlowe theatre: curtain rises on Canterbury's £25.6m revamp". The Guardian. London. Archived from the original on 28 December 2014. Retrieved 23 December 2011. ^ Oppitz, Leslie. "The lost railway". BBC. Archived from the original on 6 December 2008. Retrieved 1 August 2008. ^ a b "History of the South Eastern & Chatham Railway". The South Eastern & Chatham Railway Society. Archived from the original on 1 November 2006. Retrieved 22 April 2007. ^ "Failed rail franchise 'needed time'". BBC. 13 November 2003. Archived from the original on 2 July 2004. Retrieved 13 May 2007. ^ "Rail workers vote to hold strikes". BBC. 13 April 2006. Archived from the original on 14 April 2006. Retrieved 13 May 2007. ^ "New station means Eurostar change". BBC. 12 September 2006. Archived from the original on 27 August 2007. Retrieved 22 April 2007. ^ Davis, Matthew (12 September 2006). "Airport plan threatens Dickens' legacy". BBC. Archived from the original on 29 May 2006. Retrieved 20 June 2007. ^ Feature, Advertisement (23 March 2008). "Saving nature". The Times. London. Archived from the original on 29 May 2010. Retrieved 6 September 2009. ^ Gwyn Topham and Nicholas Watt. "'Boris Island' airport plan grounded over Johnson's briefing to Telegraph". The Guardian. London. Archived from the original on 14 July 2014. Retrieved 19 August 2014. ^ a b "Nature blow to plans for "Boris Island"". The Daily Telegraph. London. Archived from the original on 28 October 2014. Retrieved 19 August 2014. ^ "'Boris Island' London Airport designs unveiled". BBC News. 11 November 2013. Archived from the original on 9 July 2014. Retrieved 19 August 2014. ^ a b Garner, Richard (20 January 2007). "Call for end to selective education as 'grammar school areas' fail". The Independent. UK. Archived from the original on 27 January 2007. Retrieved 14 May 2007. ^ "Grammar schools have expanded". BBC News. 26 March 2004. Archived from the original on 29 August 2007. Retrieved 3 April 2007. ^ "Kent's selective schools compared". BBC News. 17 January 2003. Archived from the original on 14 February 2007. Retrieved 13 May 2007. ^ "Kent County Council". Kent County Council. Archived from the original on 25 February 2011. Retrieved 3 April 2007. ^ "Department for Education and Skills". Department for Education and Skills. Archived from the original on 2 April 2007. Retrieved 13 May 2007. ^ "Brown threatens 'failing' schools". BBC News. 31 October 2007. Retrieved 4 April 2010. ^ We ended up with a lake – Kent CEO Jamie Clifford Archived 19 June 2012 at the Wayback Machine. BBC Sport (13 June 2012). Retrieved on 17 July 2013. ^ "About the BBC". BBC. BBC. Archived from the original on 11 May 2017. Retrieved 30 March 2017. ^ Clarkson, Stuart (16 February 2012). "KMFM group can have one breakfast show". Radio Today Industry News. Archived from the original on 17 February 2016. Retrieved 5 September 2015. ^ "About Deal Radio". Deal Radio. Retrieved 30 March 2019. Wikimedia Commons has media related to Kent. Wikivoyage has a travel guide for Kent.